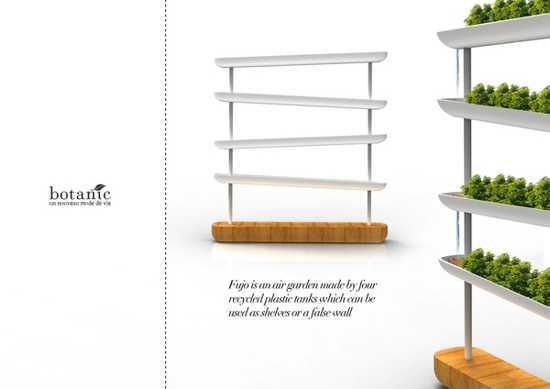 Modern furniture design that is integrating containers for hydroponically growing plants into shelves and room dividers is a good example of how green ideas influence trends in home decorating, Stylish and very decorative modern furniture pieces are designed by Clement Sarrodie. The modern furniture collection includes a shelving unit that can be used as a room divider, a glass top coffee table and a mini garden for contemporary nomads. All furniture items are eco friendly products that feature natural and recycled materials and pleasant organic shapes. White containers, combined with wooden frames look gorgeous, especially with hydroponically grown indoor plants. Fujo is an an air garden that has four tanks made of recycled plastic. The containers can be used as shelves also. 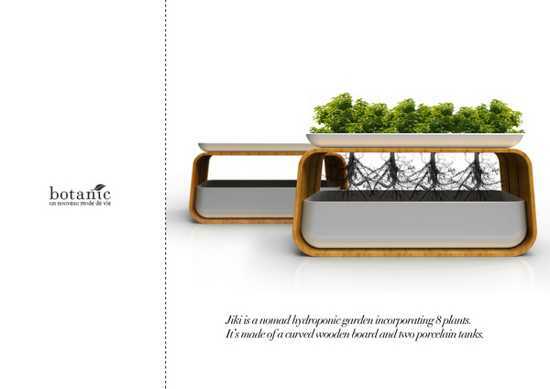 Jiki is a hydroponic garden design which is incorporating eight plants. Carved wood boards and two porcelain tanks create this beautiful mini garden design for contemporary nomadic lifestyle. 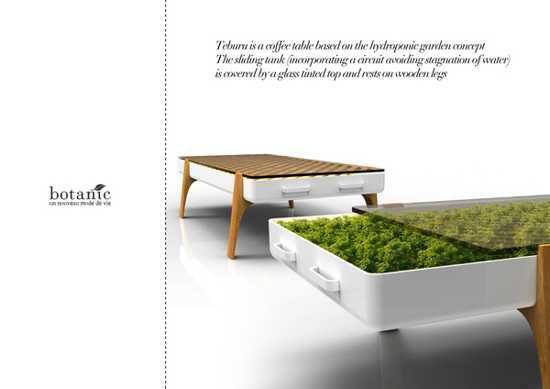 Teburu is an interesting coffee table, a wood furniture piece with a plastic water tank and a glass top. The sliding tank features a circuit for preventing stagnation of water.